Enjoy beautiful sunsets over the lake - backyard. Sunset on the Bay - 5 min walk. 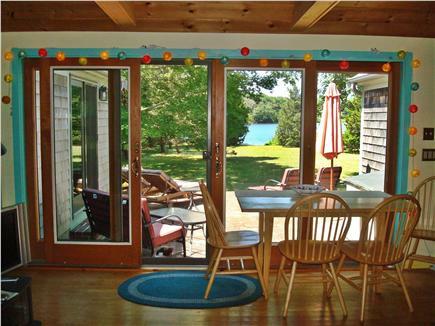 Our peaceful waterfront cottage is a classic Cape Cod retreat with many unique design features, such as a hand-made tile mural from local artist Sara Holl, custom built arched doorways, brick fireplace designed by the owner, vaulted pine ceilings, granite counter tops, and cheerful colors. The cottage is on a private road. 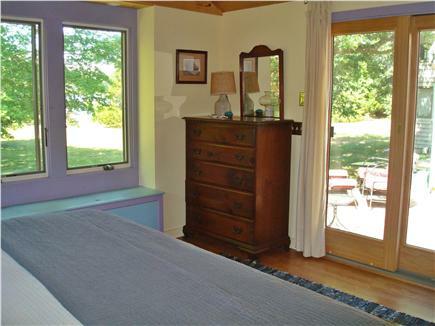 The master bedroom (king bed) looks out over a natural lawn, red cedars and the pond. (We do not use chemicals of any kind on the property). It also connects with the back brick patio via a sliding door. The bedroom off of the kitchen also has a pond view (two twins). The sunny front bedroom (two twins) is street-side but quiet. 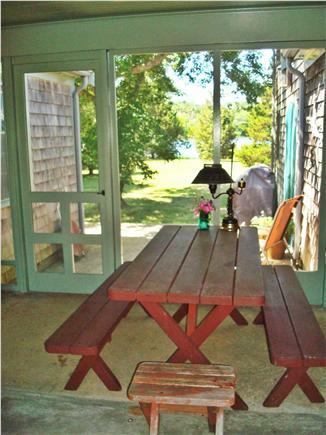 There is a screened in porch for dining - and for storing sandy beach items. The porch includes a picnic table that seats six. The pond is pristine and a nice place for swimming. 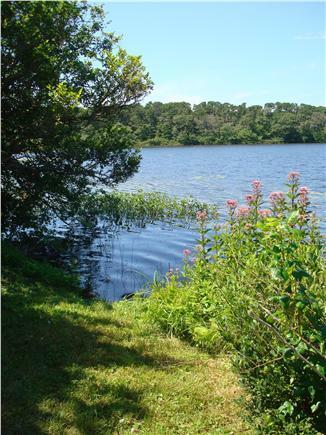 The pond is restricted to 10hp crafts, and tends to have only kayak and canoe traffic. Depending on the time of year you might see blue herons, swans, Canada geese, osprey, mallards and other lovely birds. The few people who fish on the pond go for fresh water bass. You can enter the pond at the edge of the backyard. The photo with the rowboat was taken in August - when the Joe Pye weed is high. In Sept and Oct enjoy a cozy fire while looking out at spectacular sunsets over the pond. Some guests come down for weekend getaways - this a great time of year; less traffic, more leafy color. This property has character, is perfectly situated, and might appeal to an artist who is seeking a healing retreat, golfers who appreciate that both fine-dining and local beers on tap are nearby, and beach-going families and friends. Bring your kayaks for a fresh water tour, or go .2 miles down to our private association beach or the nearby public beaches and spread out your towels and umbrellas. Near Nickerson State Park - for fall hiking and biking in the woods -also near the lovely marsh walk at the Museum of Natural History. Paddle-boarding tours are newly available(supfari.com)- safari leaders take entire families through a beautiful maze of ponds. There are also local shops for kayak and bike rentals. And sailing lessons are available at Upper Mill Pond. 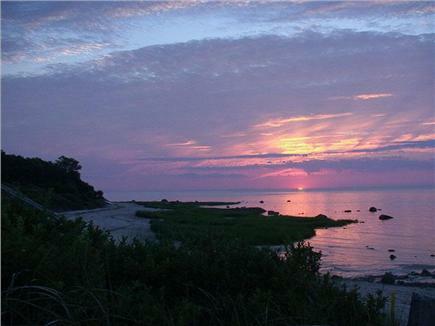 Our cottage - and the general area of North Brewster- has been described to us by many visitors as the perfect place to be on Cape Cod. Thank you for visiting. Additional availability info: Full weeks only. High season starts June 22 2019. This is a Saturday to Saturday vacation rental. Additional pricing info: Linens Avail Add $75 for 2019 Cleaning Fee $180. Trash Fee $60. 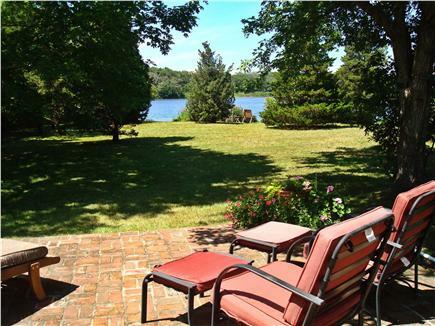 Free Private Beach Access Bay/Pond, State and local taxes of 14.45% will apply. House is one level. One step to screened porch, another to enter home. Backyard is one step down. Entrance to pond is level to lawn. Landscape is level- no stepped pathways. No raised thresholds between rooms, regular width door access. This is a lovely, comfortable, well-maintained home with a great location. It is in a quiet, walkable neighborhood. The house had plenty of space for our family of 5 as well as lots of space for storage. 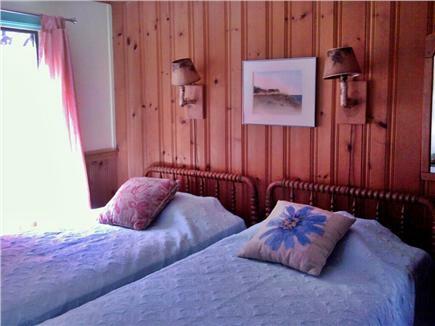 The house and property are nicely decorated, very clean, and well supplied for your visit. We cook a lot while on vacation, and this kitchen had all the pots, pans, utensils, and appliances we needed and beyond! The tree-lined backyard feels quite private. 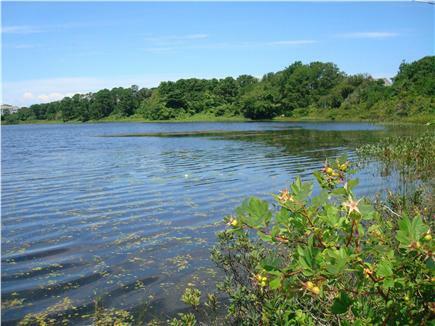 The property is situated on a small pond where we saw a great deal of wildlife. I enjoyed sitting pondside in the quiet mornings, while my kids enjoyed swinging in the hammock and my husband enjoyed his coffee on the brick patio with a view of the pond. The screened in porch was perfect for dinner outdoors. The private neighborhood beach is close enough that it's easy to walk or ride bikes back and forth to the house throughout the day. The beach was pretty quiet during the early August week we were there -- on weekdays we were often there alone or saw just one other family. A short walk away is a busier public beach which receives visits from the ice cream truck :) We really appreciated the outdoor shower upon returning home from the beach. We could also bike to the Cape Cod Rail Trail, which is about 2 miles away. In the evenings, we could walk a half mile to the General Store and ice cream shop, head back to the beach to see the sunset and walk the tidal flats, or stay home and watch sunset over the pond. My family of 5 just spent a wonderful week at this home. 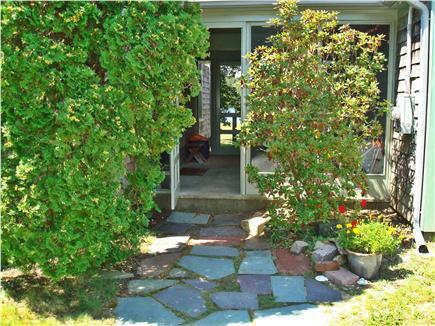 The house is situated in a private community that is only a 3 minute walk to the beach (in which we had the beach to ourselves nearly every day) plus a 5 minute walk to the Brewster General Store. The house itself was perfect for a family with 3 small children. The one-story living was great and the master bedroom was really spectacular. 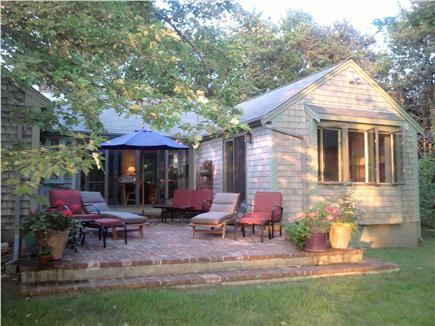 We have rented a lot of houses on the Cape, and this has been the nicest. What was really great was that this house was very well stocked. 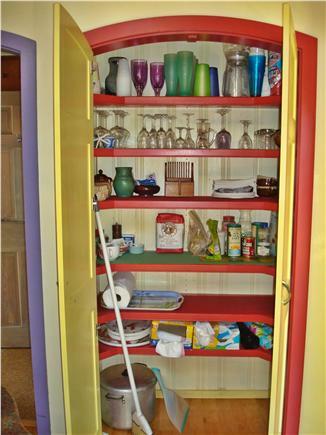 Everything you could possibly need especially in the kitchen – down to spices, plastic wrap, garbage bags, paper towels, tissues, etc – the owner really thought of everything. The back patio was where we spent most of our time. We ate all our meals out there and the views are amazing. There was an older row boat that our 7 year old daughter loved to go out on every day. The living room was a bit small, but as long as the weather is nice, there is plenty of space outdoors. The Dunbar family has been renting out our family cottage since 2012. The house was built by my grandfather in 1960, and my dad bought it in the early 1970s, and since then has renovated the house completely. We used to come down in the summer and spend our time at the beach, or on the screen porch playing cards, or in the pond behind the house. It was our favorite place to be. One thing I personally liked to do was go into the ocean for a swim and then come back to the house and get into the pond, which was always warmer. We also played a lot of games in the pond. I also enjoyed walking through the neighborhood and looking at the salt spray roses and other wild plants. I have many fond memories of making blueberry muffins with my family and walking to the Brewster Store. And going out at night to play miniature golf. And my dad liked to bring home lobsters to cook. It was a pleasant place to be. The cottage has interesting architecture inside, while maintaining a low key classic shingled cottage appearance on the outside. There are many artistic features such as several vintage stained glass installations, and tile art from local artists in more than one room. It is also colorful and cheerful. Every year we do add something. In 2015 we re-modeled the entire master bathroom, kept the full sized cast iron enamel bath and added handmade tiles to the wall. We also added an outside shower enclosure which will easily fit several small children with an adult. In 2017 we added a wall ac/heat unit to make sure the house is cool enough. and in 2018 we opened up the living room for added space. The backyard is level, has natural grass and reaches the pond - and is a good place for children to play all sorts of games. We love it because it has charm, while also being a practical vacation home. And you can walk to the beach, or swim in the pond. It is a good place to make memories. Brewster is an old sea captain's town and the downtown area close to us has interesting historic buildings and has kept its charm. You can walk to the Brewster store from our house and get the morning paper and a donut, or come back later in the day for ice cream at the Brewster Scoop. 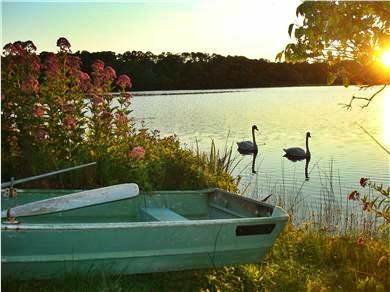 The town has interesting things to do for adults and children - you can rent paddle-boards and go for a guided tour on upper mill pond, or take your kayaks out on our pond or to the local state park. There are several golf courses, good antiquing, fried clam shacks and fine dining. We also have a great new coffee shop at The Herb Shop and for yoga enthusiasts you can get a week pass for Brewster Bikram Yoga, or drive to Dennis to Yoga Cape Cod for more variety. We recommend the Brewster Fish House for fine dining and Chillingsworth for a bistro style menu. If you want to sit outside for lunch you can try Al Fresco for a lobster roll or a sandwich - and then visit the Kitchen Shop which has great gadgets. For kids there's Kate's Ice Cream, and Joe's Clam Shack, and Cobies for burgers. In 2015 the town added sidewalks - you can now safely walk to the Brewster Coffee Shop for breakfast, or enjoy a morning walk in that direction past old homes and interesting plantings.